Vocational education prepares students to work in a trade/craft or to support professionals in the workforce. Our vocational ed worksheets focus on key skills students need to be successful in the workforce, such as technical reading, writing, and mathematical skills, as well as industry-specific vocabulary and content. Don't see a printable you need? Use our Test Maker™ to create your own printable that fits your needs. Browse Vocational Education questions or use our advanced search to find existing questions while filtering by grade levels and keywords. You can also create your own questions. Our business technology worksheets cover a range of business and technology skills, including how to use popular programs such as Microsoft Office and understanding the basics of business accounting and digital literacy. Our cosmetology worksheets are ideal for those seeking certification in cosmetology as part of a vocational ed program or those who simply want to learn more about the field. Worksheets cover skills from hair care and styling to skin care and nail tech skills. Our culinary arts worksheets are designed for students enrolled in a culinary arts program or course and those who simply want to improve their culinary knowledge. Worksheets cover a range of skills, from knowledge of basic cooking terms to more advanced food preparation techniques. Our plumbing worksheets are perfect for interested parties who are pursuing their plumbing certifications or brushing up on their skills. 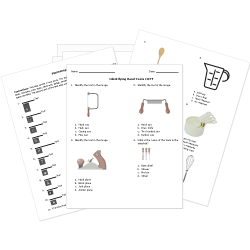 Our worksheets cover topics ranging from identifying common plumbing tools to performing general plumbing repairs.